An Imation/TDK representative sent us a press release today about the launch of TDK Life on Record 6x Blu-ray Discs in North America. The following text was taken from this press release. Blu-ray media has the high capacity needed to handle content like high-definition movies and television â€“ 25GB on a single layer and 50GB on double layer discs, about 5-to-10 times the capacity of standard DVD media. TDK Life on Record Blu-ray 6x discs have the fastest recording speeds currently available in the U.S. market with data transfer rates of up to 216 Mbps â€“ equivalent to approximately 20x recordable DVD media. Using TDK Life on Record 6x Blu-ray discs, consumers can record 25GB of data in as little as 17 minutes â€“ approximately six minutes faster than a 4x BD-R.
TDK Blu-ray discs are ideal for consumers who expect their archived digital memories to be there in years to come. They feature revolutionary Durabis 2 hard-coating technology, which delivers a high degree of protection against scratches, fingerprints and dust. Additionally, TDK Blu-ray discs incorporate a unique inorganic double-layer metal recording structure that resists against breakdown from exposure to light for superior durability and longevity. TDK Blu-ray discs also address compatibility concerns with newer technology. They offer one of the industryâ€™s highest compatibility with the wide range of Blu-ray recordable hardware and are compliant with Blu-ray disc recordable format VER. 1.3. 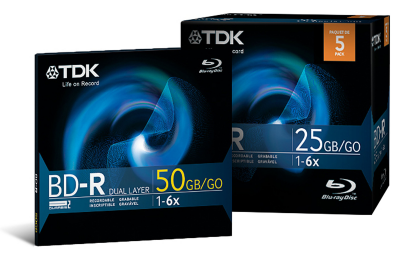 TDK Life on Record Blu-ray 6x media is available in 25GB single layer and 50GB double layer capacities starting in October at select retailers for suggested retail price of $13.99 for a BD â€“R 1 pack; $32.99 for a BD-R DL 1 pack.